Aurelius Augustinus, Augustine of Hippo, nai to Saint Augustine (13 November 354 – 28 August 430) ek philosopher, theologian aur ek bishop rahaa. Uu North African ke city, Hippo Regius me aapan aakhri din bitais. 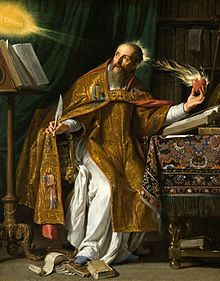 Augustine, Western Isai ke develop kare ke ek khaas jan rahaa aur uske ii church ke ek suruu kare waala maana jaawe hae. Uu original sin aur just war ke concept suruu karis rahaa. Roman Catholicism aur Anglican Communion me uu saint aur Doctor of the Church, aur patron of the Augustinian religious order maana jaawe hae. Dher Protestants log, jaada kar ke Calvinists, uske ek theological father Reformation teaching salvation aur grace khatir maane hae. Eastern Orthodox Church me bhi uu ek saint hae aur uske feast day har saal 15 June ke celebrate karaa jaawe hae. Orthodox log me uske Blessed Augustine, nai to St. Augustine the Blessed ke naam se jaana jaawe hae. .
Retractions (book): Aapan jindagi ke aakhri din me (ca. 426-428) Augustine, aapan pahile waala kaam ke fir se dekhis aur ii batais ki Retractions (book) ke duusra rakam likhta. ↑ "Blessed Augustine of Hippo: His Place in the Orthodox Church: A Corrective Compilation". Orthodox Tradition XIV (4): 33-35. http://www.orthodoxinfo.com/inquirers/bless_aug.aspx. Retrieved 2007-06-28. Regle de St. Augustin pour les religieuses de son ordre; et Constitutions de la Congregation des Religieuses du Verbe-Incarne et du Saint-Sacrament (Lyon: Chez Pierre Guillimin, 1662), pp. 28-29. Cf. later edition published at Lyon (Chez Briday, Libraire,1962), pp. 22-24. English edition, The Rule of Saint Augustine and the Constitutions of the Order of the Incarnate Word and Blessed Sacrament (New York: Schwartz, Kirwin, and Fauss, 1893), pp. 33-35. Ii panna ke 13 March 2016, ke 16:22 baje, pichhla time badla gais rahaa.